When To Call a Tree Trimming Professional | Mr. Tree, Inc.
A tree, like any other living thing, requires proper care in order to stay healthy. There are a wide variety of environmental factors that can influence the health of a tree; damaged or diseased areas can easily spread, ultimately putting the whole tree at risk. Disease can spread from tree to tree and also threaten the safety of nearby people and property. To ensure the health of your tree, it’s essential to trim your tree periodically. Removing weak, sick, or damaged branches as they develop will allow the healthiest branches to grow freely, leaving you with a strong tree that will last for many years. Often, tree trimming is a task you can undertake yourself; it’s relatively simple to do some minor trimming on your tree without the help of a professional, provided you have the proper equipment to do so. Even a perfectly healthy tree will need occasional trimming. Trimming ensures the health of the tree by removing the weaker leaves and branches and allowing the strongest ones to make use of the maximum possible amount of the tree’s available energy. With larger trees, it is usually not cost effective to attempt to trim them yourself. The process of trimming a large tree is a labor-intensive and potentially dangerous one. Furthermore, if the tree is not pruned correctly it may end up doing more harm than good. Branches should be pruned while they are young and special care must be taken to avoid over-pruning. Usually, this type of work is best left in the capable hands of an expert. Trees are vulnerable to a wide variety of diseases, which vary depending upon the species of tree, the environment, and a number of other factors. If you notice signs of stress on your tree, you may need to call in a professional who can properly diagnose and treat the problem. While certain symptoms – such as yellowed or shrunken leaves – may be signs of stress caused by under-watering or over-fertilization, they may also be signs of a viral or fungal infection. In Oregon, bacterial, fungal, and viral infections can be transmitted easily by insects or other damaged tree parts. Likewise, lesions under the leaves of a tree can be caused by fungus or bacteria. The proper treatment will depend on the exact nature of the problem. Too often, overeager homeowners attempt to simply cut away sickly leaves, only to wonder why the tree does not seem to be recovering. Without solving the problem at the source of the illness, the tree cannot become healthy again. Professional tree trimmers can assess exactly what is afflicting your ailing tree and recommend a course of action. While trimming smaller branches is a relatively quick and painless process, removing larger limbs can often pose a risk to people and property if not done with the proper training and equipment. Tree limbs can become damaged by heavy winds or other adverse weather conditions, leaving them hanging precariously and in danger of falling. When these large limbs are removed, it is not simply a matter of cutting them and letting them drop. They must be guided in such a way as to be brought to the ground safely. More often than not, this requires special equipment that only a professional will have on hand. Never attempt to trim trees yourself if you are in danger of coming into contact with power lines. 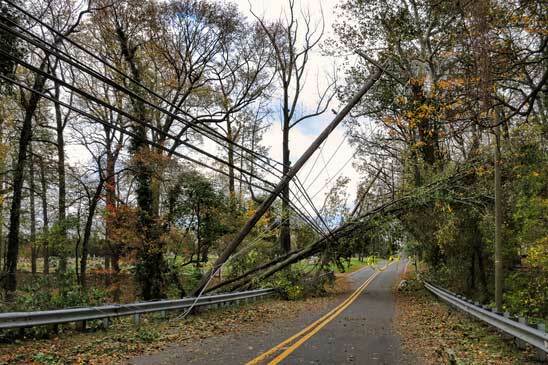 Power lines carry thousands of volts of electricity and you should always assume that they are energized, even if they have been downed by tree branches or inclement weather. If you notice a branch growing close to or making contact with a power line, or a broken limb that has fallen into a power line, contact your local tree trimming service to decide if the limb should be removed. A dead tree on your property can potentially pose a large threat to life and property. Not only is it a hazard, it can also attract insects such as termites or carpenter ants, which, if not removed properly, can spread into the rest of your home. Removing a dead tree from your property on your own is not recommended for these reasons; a professional will be able to provide the equipment, insurance, and training necessary to do so without putting your safety or property at any undue risk. In many cases, a professional tree service can also help you plant a new tree to replace the one you remove. While utilizing the services of a professional tree trimmer may seem costly, it will save you a great deal of stress in the long run.